At the time I thought the only awesome thing about watermelons that people calling genetic engineering was seedlessness. It turns out there are also square watermelons. Are they genetically engineered? I guess my title does kind of give away the answer. Square watermelons aren’t the product of genetic engineering, or radiation mutagenesis, nor even conventional breeding. Instead they are a result of a technology known as “the container.”* Farmers, primarily in Japan, place a box around a fertilized watermelon flower. As the watermelon grows it fills the container, eventually filling even the corners. When the box is removed, it reveals a cube shaped watermelon. 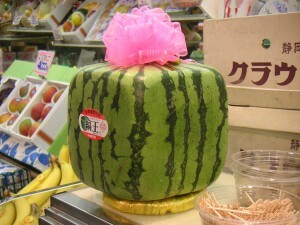 There’s no real benefit to growing a cube shaped watermelon, yet some people will pay more for one. Interest in strangely shaped or colored foods in a natural response for many of us human beings. It’s the same things (fruit growing inside containers, and a fascination with strange food and drink) which results in complete pears inside bottles**. The bottle is put around the fertilized pear flower, and the pear develops inside. A great way to puzzle people who usually think in terms of buying food rather than growing it. 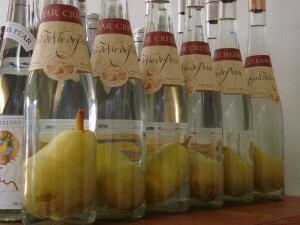 **If you’re interested, there’s a six minute youtube video with all the info you could ever possibly want on the proper technique for growing pears inside wine and liquor bottles. <- Be forewarned! If, like me, you don’t actually have access to a pear tree, watching this video will just leave you frustrated with your life.